Dieses habe ich im Garten einer Freundin entdeckt und finde es sehr hübsch und einfallsreich. Alte Töpfe hat fast jeder, und die Sedum sind ein pfiffiges Detail. This one I’ve discovered in the garden of a friend and think it’s very pretty and creative. We all have old pots and the sedum are a cute detail. Habt ihr auch Vogelbäder im Garten? 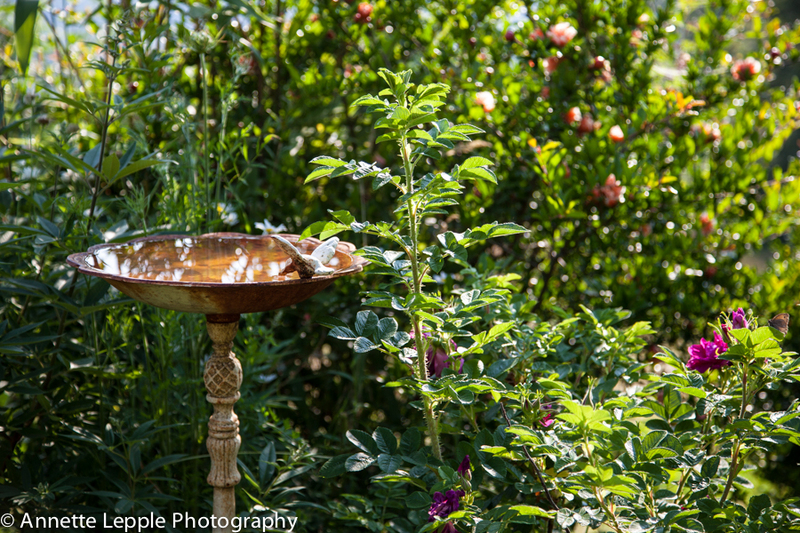 Do you also have bird baths in your garden? Wow, die Beton-Blatt-Vogelbäder schauen ja richtig gut aus! Aber das Vintage-Töpfchen auf Sedum ist auch sehr originell. What a lovely idea. 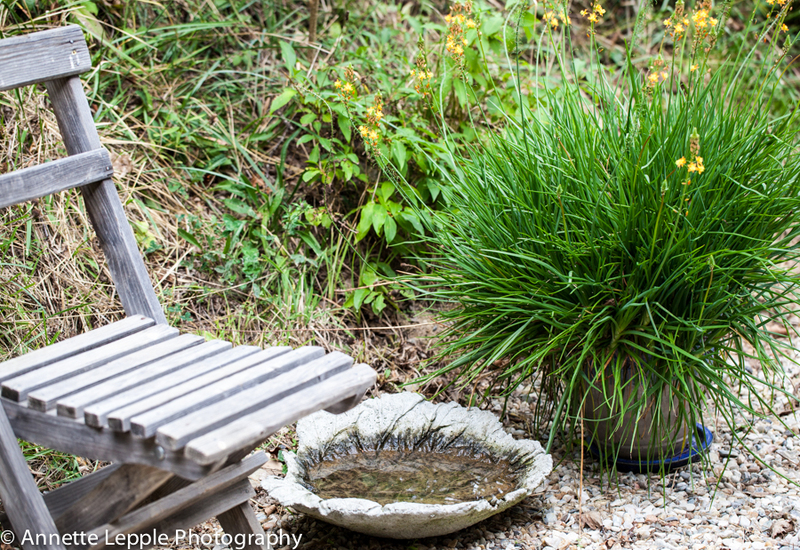 I don’t have pools of still water as I don’t want to give the mosquitoes any opportunity of breeding near the house. No worries, Christina, a bird bath has to be cleaned and topped up daily so no risk of anything breeding there. The bats do a wonderful job here as we don’t have any mosquitos really. Pretty bird baths Annette. I agree it’s fun to watch the birds enjoying themselves in the water. Have you got a bath for them too? I do! I have 3 baths scattered around my garden. Two of them were busily occupied today at lunch as a pair of mockingbirds each claimed a bird bath for a few minutes of drinking, cleansing and splashing. So fun to watch. I have two and, like you, enjoy watching the birds using them. The gold finches are particularly active. Goldfinches don’t bath properly here they just drink so you’re lucky! That was one of the unexpected bonuses of the stream, Annette – a joy to watch the birds there and in the little sink outside the kitchen window. Thanks for sharing yours and your observations – what a lovely idea to cast them in leaves…..might borrow that sometime! What happened to your stream now, Cathy? I remember you couldn’t seal it. Pity! I love your rhubarb leaf birdbath. What an original idea. I have a birdbath near the window so that I can watch the birds from the house. They also use the pond for their ablutions. 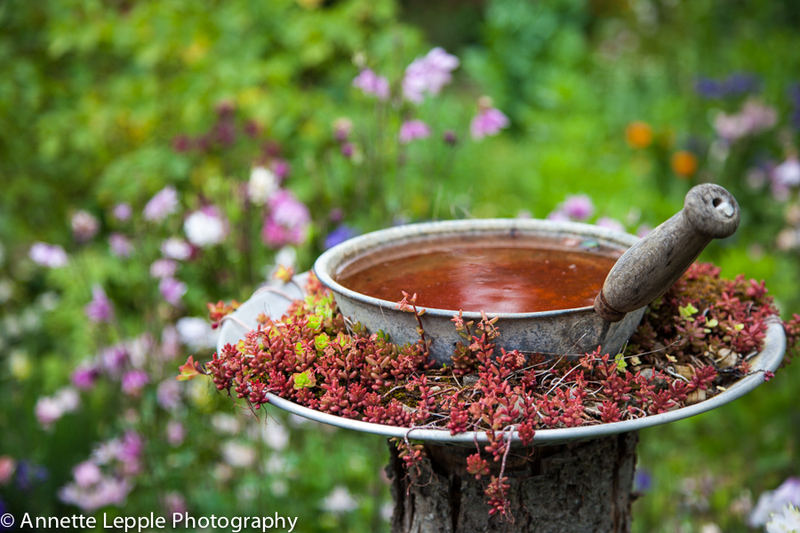 I am going to copy your homemade birdbath though because it looks so pretty. Sehr schön die Idee mit dem Blatt, das werde ich mir notieren und hoffentlich auch dann nachmachen. Ich habe auch einige Wasserbecken für die Vögel im Garten, die aber ganz unterschiedlich genutzt werden. Der Lieblingsplatz ist der hässlichste, eine ausrangierte Lecksteinschale der Pferde aus Plastik, die eigentlich das Wasser für die Schweine ist, die aber da nicht rangehen, aber die Vögel sind begeistert, irgendwie scheint sie die Idealform zu haben, das Tolle ich kann sie vom Küchenfenster aus gut sehen. Die Vögel merken also nicht, dass ich sie beobachte und sind dann voll in ihrem Element, da könnte ich stundenlang zusehen, und manche Vögel sind auch recht ausdauernd. Da wir dieses Jahr auch keine Pfützen hatten, waren die Badestellen besonders beliebt und auch nötig. I’ll bet the birds really appreciate the effort you go to Annette. 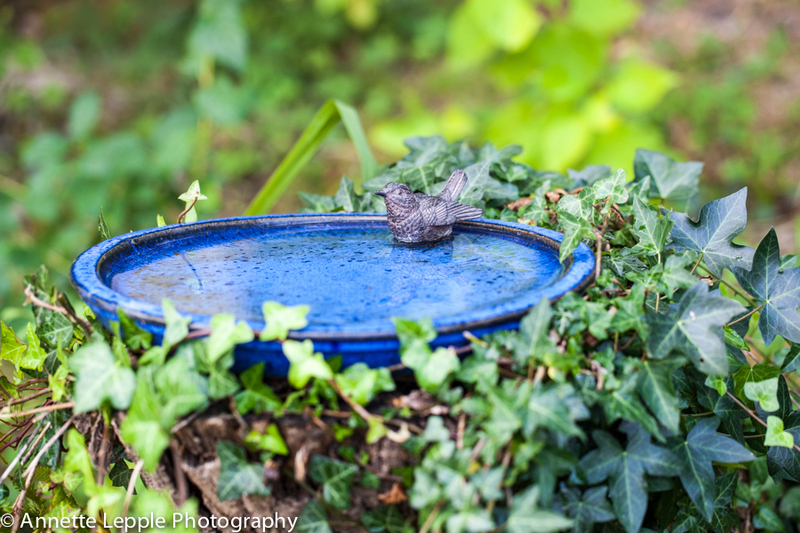 I have a couple of bird baths but never ever see a bird in or near them. I don’t know if the cats are the cause – they certainly don’t stop them going to the feeders. I love your hand crafted ones – very clever! 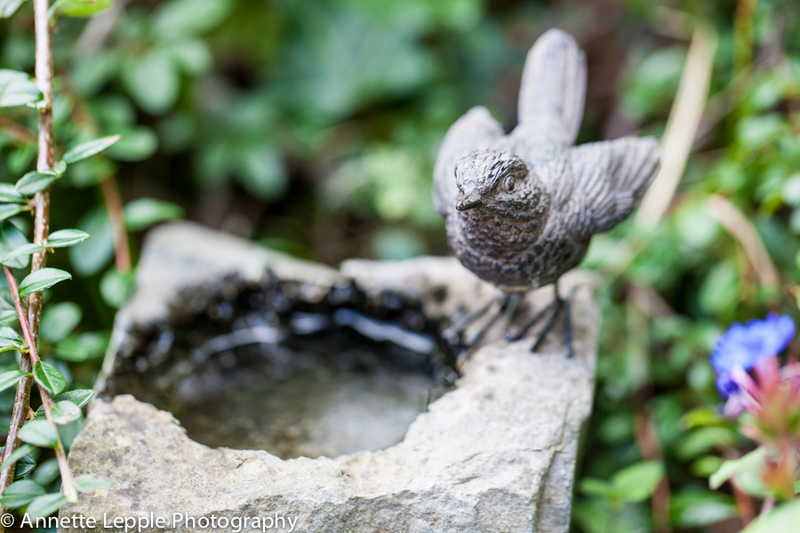 I also love watching birds in the birdbath, both bathing and even just drinking. 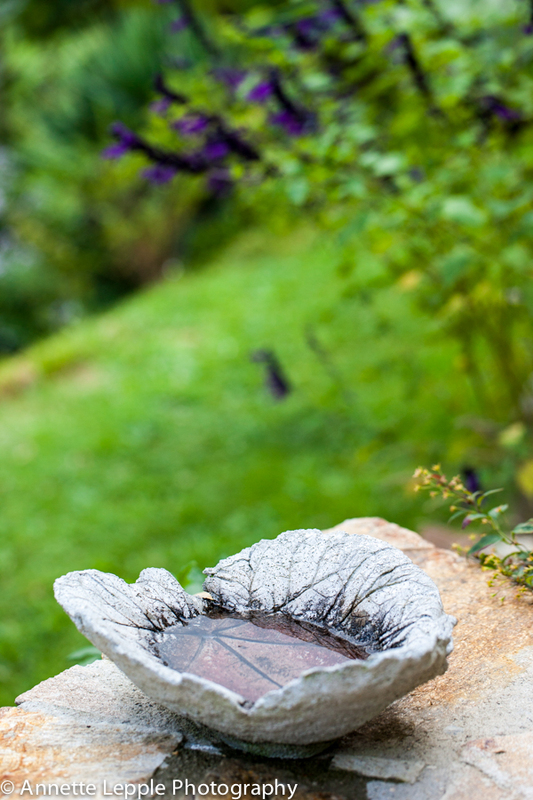 Lately I’ve been so busy I haven’t gotten to refilling our three birdbaths, plus our little fountain birdbath has a crack I haven’t been able to keep sealed. Well, they always make their own choices and it’s funny what they can come up with! 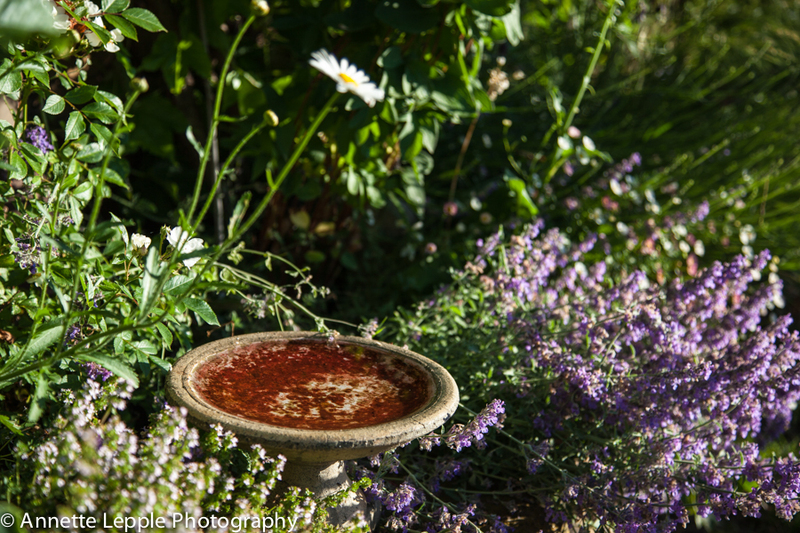 I am envious Annette, your birdbaths are all beautiful to look at and when birds are there too it must be magical. My youngest daughter left her cat here when she went off to uni, so no birdbaths for us. Lots of bird feeders but birdbaths are too tempting. They are very attractive, particularly the pot sitting in sedum. I like your bird baths Annette especially the leafy ones. We just have one in the garden but also have a small stream running on one of the garden boundaries so there is always water available for the birds. Toll! Wir haben ein zweigeschossiges, oben im flachen baden die Meisen und unten die Amseln und Elstern, oft sogar gleichzeitig.